FIDEL CASTRO’S AGRICULTURAL FOLLIES: ABSURDITY, WASTE AND PARASITISM, by Emeritus Professor José Álvarez, documents Fidel Castro’s responsibility for Cuba’s economic disaster. Using the agricultural sector as the analytical framework, the book evaluates Castro’s absolute power in decision-making. 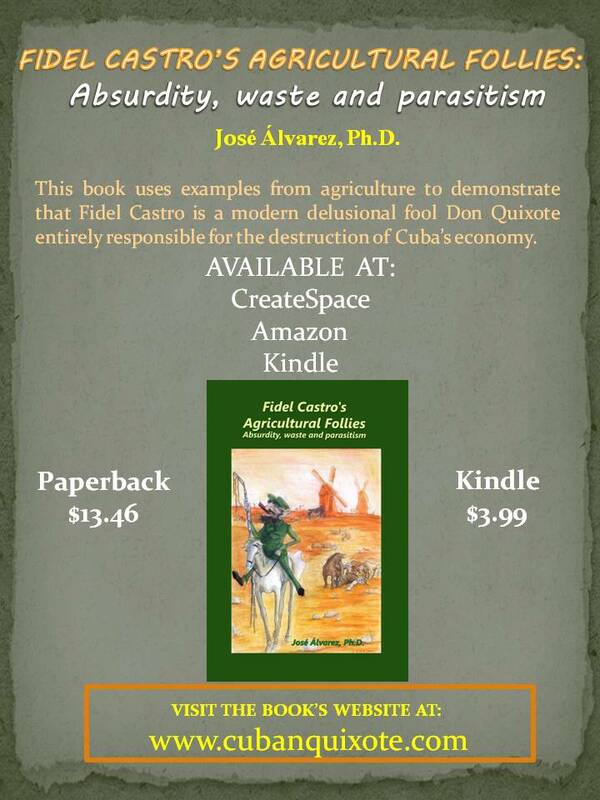 Oct. 1, 2014 – WELLINGTON, Fla. — Contrary to what the title implies, this book is not about agriculture; rather, the author uses examples from agriculture to make the point that Fidel Castro is a delusional fool, a modern Don Quixote, who has “sunk Cuba into a sea” of misery and despair. Agriculture in this book is loosely defined. Can one say that building a room where only the heads of cows are exposed to air conditioning so as to increase their milk production is an agricultural activity? Can one claim that a single cow can provide milk for thousands of people? In fact, one must forgive the reader who concludes that the follies described in this book are the fictional musings of the author. They are not; these follies actually took place and they are very well documented. It has been said that the problem with a socialist economy is that the leaders eventually run out of other people’s money. However, time and again, as shown in the book, the Castro brothers have managed to find the money to subsidize Fidel’s follies. By theft, charity and defaulted debt, they have kept their failing socialist experiment afloat for over fifty years. The time has come to evaluate Castro’s performance in the economic field. On July 31, 2006 Vice-President Raúl Castro assumed the duties of President of Cuba’s Council of State in a temporary transfer of power due to Fidel Castro’s illness. On February 24, 2008 the National Assembly of People’s Power unanimously chose General Raúl Castro as his brother’s permanent successor. Although Fidel Castro has partially recovered, he will not resume his former duties. His complete control over the economy in general, and the agricultural sector in particular, during nearly fifty years ended with his illness. The book contains 12 chapters (under three parts: absurdity, waste and parasitism), an appendix and an afterword. Additional materials have been placed on a website devoted exclusively to the book. (www.cubanquixote.com ). Tom Gjelten believes that, «in choosing Cuba’s disastrous experience with agriculture to illustrate some of Fidel Castro’s bizarre delusions, José Álvarez has found a novel way to tell the familiar story of the failure of Castroism. 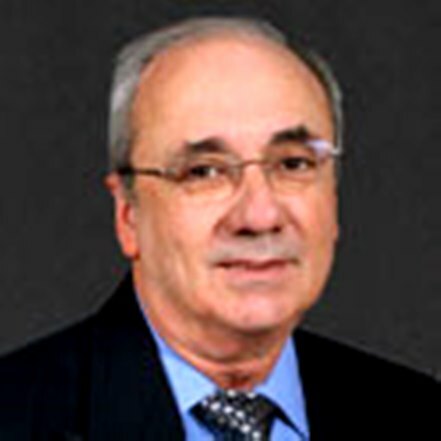 José Álvarez left his native Cuba in 1969, obtaining a Ph.D. in food and resource economics from the University of Florida, where he finished a productive academic career in 2004, receiving the title of Emeritus Professor. A great deal of his time was devoted to study Cuba’s agricultural sector. He obtained private support and was able to pay several professional visits to the island. For his work on Cuban agriculture, Professor Álvarez received the «National Honor Award for Superior Service», the highest honor conferred by the United States Department of Agriculture to an agricultural researcher. 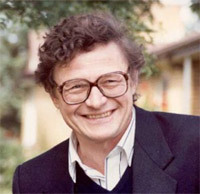 Six of the 16 books he has authored or co-authored have received 17 national or international literary awards and recognitions. This entry was posted in Blog and tagged Agriculture, Fidel, Sugar Sector. Bookmark the permalink. The notice of the publication of my Revolutionary Cuba: A History by the University Press of Florida may be of interest to your readers.